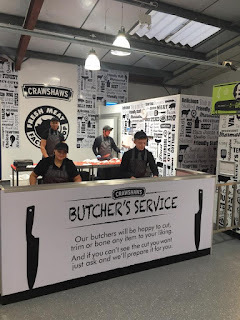 Rotherham-based Crawshaw Group PLC, the fresh meat and food to go retailer, has given an update on its transitional plans. The AIM-listed Hellaby firm announced growth plans in 2015 that included £200m of investment, opening 200 stores and creating 2,500 jobs. It secured new investment in April this year that was expected to enable the restart of its accelerated new store opening programme, with an initial focus on factory shop locations. In its results for the 26 weeks ended July 30 2017, the board said that progress had been made against the strategy to position Crawshaws as Britain's leading value butcher. The strategy is focused on accelerating the rollout of its factory shop format. These destination sites are seen as particularly attractive as they allow the retailer to offer even greater value to customers through larger pack sizes and value progression. Factory shops are a simpler model to implement and operate, have lower rents and require significantly lower set up costs. Crawshaws now has eight standalone factory shop units and has reduced set up costs by 25% to aid future openings. The target rate is ten new shops a year, with factory shops expected to account for well over half of group revenue in 2020. New stores in Liverpool and York are the latest openings. Revenue for the group was up 2.3% to £22.1m but a loss before tax of £1.2m was reported. Losses had widened from the loss of £0.4m reported in the same period last year. Like for like sales were down 4.2%. Crawshaw said it had re-established its customer base but margins were being affected by a weakness in sterling. In April, heads of terms were agreed on a deal for 2 Sisters Food Group founder and chief executive, Ranjit Boparan (and connected party), to invest approximately £5.1m for a 29.9% stake in Crawshaw, with warrants to acquire a further 20.1% of the Group. The deal, which saw Boparan become an advisor to the Crawshaw Board, also includes an initial three-year supply agreement for Crawshaw to acquire fresh meat and other products from 2 Sisters, one of Europe's largest meat and food producers. Noel Collett, CEO at Crawshaws plc, said: "These results demonstrate progress in ensuring we have high quality products at the lowest possible prices. The improvements to the breadth, depth and price of our ranges are driving the significantly improving trend in customer numbers, which is a key metric of loyalty and success in preparation for the important winter and festive season ahead. "As part of our focus on achieving unbeatable value, we are prioritising and accelerating the rollout of our proven factory shop format. The economics of these sites are hugely attractive, and they allow us to offer a wider range of fresh meat and associated products at a price not possible in our high street shops. "We remain excited by our 2Sisters supply agreement and believe this partnership will be transformational for the long-term growth of the Group. Market conditions remain challenging, but we are confident that our focus on value leaves us well placed for the long-term." Jim McCarthy, chairman of Crawshaw plc, added: "Since joining Crawshaws earlier this year, I have been impressed by the progress that Noel and the team are making. The accelerated roll out of the successful factory shop format is strengthening the business's reputation for delivering amazing value, which is underpinned by the transformational supply agreement with 2Sisters. "Crawshaws is one of the most exciting businesses in the value sector and the Board is confident that all the work done this year means the business is well set to create value for investors."